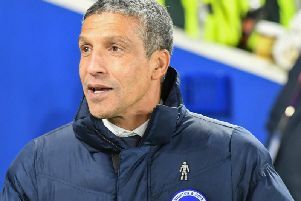 Winger Solly March feels there have been plenty of positives for Brighton to take from their past three Premier League games - but was disappointed not to get on the scoresheet against Fulham on Saturday. The Seagulls fought back from 2-0 down to draw 2-2 thanks to a double from Glenn Murray but March missed a golden opportunity at 1-0. He raced through on goal but shot over with just Fulham keeper Marcus Bettinelli to beat and the opening was still on his mind immediately after the game. He said: "At 2-0 you'd take a draw but we were disappointed because we started the game quite well. "We missed a penalty, I missed a chance and I think if we'd taken our chances we'd have won the game easily. "My chance is one you've probably got to take. But we got a point from 2-0 down, so we're not too disheartened." March produced a stand-out performance in the 3-2 win over Manchester United last month and after his outings against Liverpool and Fulham, there are signs the winger is getting back to his best form. He said: "I've been improving but if I take the chance today it's a better game for me. "There's still stuff to work on and improve on." Albion head to Southampton after the international break on September 17, before matches with Tottenham and Manchester City, and March said: "We'll build up to it after the international break and train hard going into it. "We need to come away with something. "We'll take the positives from these last three games and we'll be looking to win the next game. "We've got four points from four games, so we're on track but we want to do better."